2013 was another one of those years when circumstances acted to keep me from getting much artwork done. Not that it wasn't a busy year, just not a lot of prints to show for it. Here's a breakdown of how things went, all the details of which can be found back on this blog for those who care to look. Prints- Not including the annual holiday card, only two new prints were created this year, two saints. One created for a specific person, one created to be a demonstration piece. I've really got to improve that for next year. Shows- I count being part of 10 exhibitions in this calendar year. Half were in Belmar, and the rest were scattered around, all places I have exhibited in the past. The biggest show was the fourth ever presentation of the whole Fourth of July piece (366 prints). I count 20 prints total in the rest of the shows, which had anywhere from one to four works in them. Although it didn't involve any of my prints, the Table Talk show had 18 tables in it, all of which I had been involved in constructing. 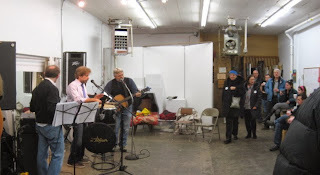 Publicity- I was mentioned in a review of the invitational show in Rahway, Preemptive Strike. I was interviewed by phone in connection with Table Talk, part of my responses appeared in the online only newspaper that conducted it. Awards- My contribution to an online exhibition organized by Audubon Artists won an award in the printmaking category. Firsts- Although I have hundreds of prints visible online all the time, the above mentioned Audubon show was the first time I have been part of a specific juried exhibition that only existed as images on a website. Although it had nothing to do with printmaking, my artistic skills were called on to paint sets for a theatrical production, including a giant forest backdrop, simulated stone walls of a castle, and miscellaneous parts of the stage. I've helped paint murals all over Belmar, but for the first time I developed a plan for designing one myself. It ended up not being chosen for the specific project, but there's a good chance the images may be used for a future mural project in town. 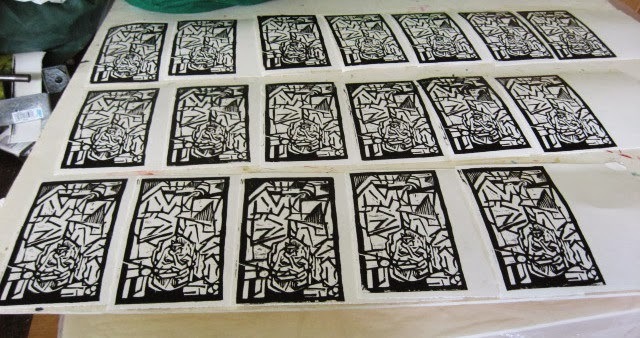 Miscellaneous- I ran four sessions of my woodcut class at the Belmar Arts Council, although events did once again force a few of the meetings into the Studio when the Boatworks was undergoing construction. 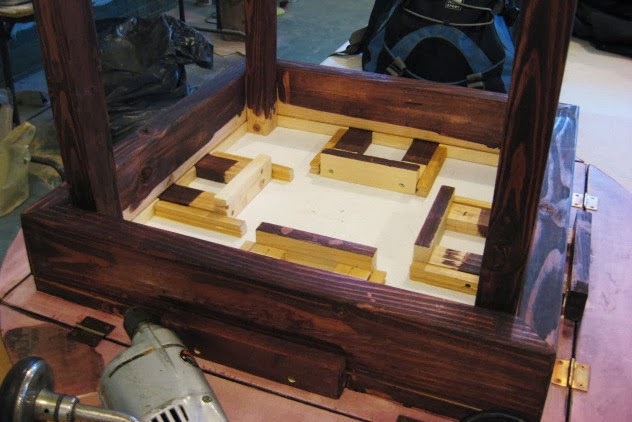 To meet Molly's demands, I had to come up with a new design for wooden tables, including a drop leaf table that could convert from round to square. The Studio- In the second half of the year, operations expanded into a second larger space thanks to an additional room rented by Molly specifically for the table project, but we did hold a few critiques there, too. I finished my part of that job a month ago and removed my tools, but Molly still has some stuff in the other room. Our print shop needs some repairs and reorganizing, ignored over the past several months while we were occupied with building tables. Next Year- With the table project done and all the family moving (including my own) done, I really need to get back to making prints again. I need to start thinking about a new saint for my new nephew, and it's been two years without completing a new boardwalk print, so that is also a priority. With plenty of planned prints to work on, I haven't spent much time thinking about new ideas, but sometimes these things appear suddenly and develop quickly. Check in here throughout 2014 to see what happens. Over the past few days I colored a batch of the new holiday card, half the colors last night, the rest today. Got eight done in this first group, and have at least 6 more here at home that are ready to color. Only got one distributed so far, one I left up at the Studio for Molly. I'll be mostly relaxing on tomorrow's holiday, so maybe I'll try to get these all written out and ready to mail when the post office opens again on Thursday. Christmas is a few days in the rear view mirror, so time for me to start working on my Christmas cards. I finished the prototype a few days ago, but now I have to make the edition- printing, trimming, coloring, writing, and mailing. Took care of that first step today. I have significantly fewer names on the list than when I started making these 20 years ago, so I can get away with making fewer. I tore down enough paper today to make 18 cards. Printing these is always tricky. Between the hard slick paper, the lack of margin, and the very small area to hold it down while rubbing different parts of the block, a few cards are always ruined by shifting on the block. In today's effort, I ended up with eight that were close to perfect, four that were pretty good with flaws that will by hidden in coloring, two that I'll use if I have to, and four that were rejected. Throw in the two cards from the initial printing and I should have enough to send to everyone who has earned one. Have to let them dry a little, but maybe I can begin coloring on the weekend. As usual, a whole lot of events converge around the end of the year, conspiring to push my card production and distribution into the next calendar year. However I was able to get one prototype made in time for posting today, and I hope to get the rest produced in the next few days, and out to the good boys and girls on my Christmas list (the few people who still actually send me cards). That mean looking Santa above will deal with the rest of you. Okay, he's not really mean, just out of sorts from his own busy season and going cubistic. Give him a few days and he'll be fine. After another Tuesday of driving around North Jersey in a snowstorm, I had a relatively simple day. Lots to do, but easier stuff. I had a block of time around the middle of the day, so I went up to the Studio to pull a few proofs of my new Christmas card block. When I do the big print run I start with full size sheets of Bristol board, which I can tear down into a dozen pieces the size I need for the folding card. I think that the sheets I had got used early in the fall making example pieces for my 3D Design class, so all I have in stock right now is a 9"x12" pad. I took two of those pieces, tore each into two pieces- one for a folded card, and a smaller piece for just a flat test proof. I pulled four proofs this way, all nice and clean. Packed them for the trip home, and brought my watercolors as well. Over the weekend I will try some coloring, and with four prints to work with, I'm sure I'll get at least one suitable BAT. At the college I teach at the next few days I can get some suitable printing paper and do the larger edition early in the week. They won't go out until after Christmas, but people are used to that by now. Have a week left of classes, which means that Christmas must be getting closer. Sure enough, the calendar tells me it's a little over a week away. 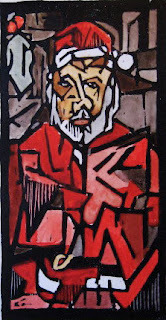 Lots to do in those days, including creating this year's card. I came up with a possible idea last night, and I had a piece of wood all ready to go. 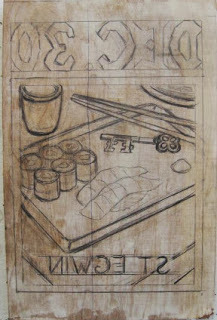 Even have all my tools at home, with other stuff I had used in the most recent woodcut classes in Belmar. (all my time in the Studio since the summer had been devoted to tables) But thinking about it this morning, something about the painting and my idea for the adaptation seemed familiar, and I started wondering if I had done this one before. I started doing holiday cards like this (making Christmas/winter scenes based on famous paintings from all of art history) since my last Christmas in Carbondale in 1994. That one was Van Eyck's Arnolfini Wedding Portrait- the woman in a green dress transformed into a tree, her husband's fur trimmed coat given a Santa make over. I've done a new one every year since then, which by my count meant I had made 19 of these so far. I didn't have a master list, and while I'm sure that I have at least one copy of each somewhere, I knew I wasn't going to be able to locate them all this morning. I found one big bunch, then another handful, searched my memory, and scanned the spines of art books on my shelf. Eventually I was able to put together the full list, though not in order. For future reference, besides Van Eyck, there were two from Van Gogh, two from Hopper, and the rest came from Greek pottery, Mondrian, Miro, Schiele, Degas, Sargent, Thiebaud, Masereel, Dix, Vermeer, Hogarth, Ryder, Bosch, and DeChirico. Images of the last several can be found on every Christmas Day on this blog. Having accounted for all 19 years' worth of cards, I decided that my new idea hadn't been done before and it was safe to proceed. Drew it quickly and got it cut in about an hour. Printing will have to wait a few days, but I expect that to happen in time to have a colored prototype up on the blog for the 25th. You'll have to wait until then to see what it is. In the critique group that meets in our Studio, there has often been a custom to do a little homemade artsy gift exchange for the holiday, though usually not getting done until January as we artists are often not organized enough to do something for an early December meeting. Last year it was suggested that instead we make some baby gifts for group regular Jane, expecting her first. The baby came in late December, and she had sent a photo and birth information to Molly in time for us to see it at our January meeting. I decided to go ahead and make a saint print for the occasion, which would also serve the purpose of helping to restock my overall supply of saint blocks, mostly destroyed by Hurricane Sandy. Molly told me the birth date was December 30th, a date I had never done. 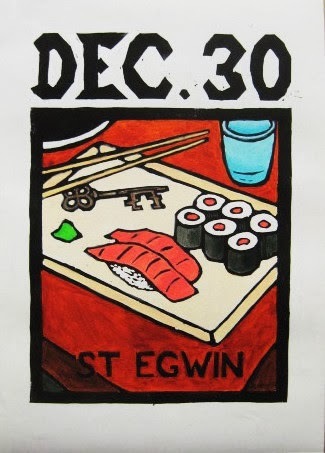 After looking through the options in copy of Butler's, I chose St Egwin as the best. It's a common enough story- a reformer type upsets locals who don't agree with his zeal and try to get him discredited and removed. Egwin was asked to leave his home church in England and report to Rome. Before doing so, he made the point of putting himself in iron shackles and tossing the key into the Avon river. He eventually arrives at the Vatican and the complaints are dismissed, and a fish is caught (maybe in Rome, maybe between France and England on his return trip) containing the key to his chains. (finding things in fish is not an uncommon occurrence in saint stories) I've done at least 3 other saint prints that involve fish or fishing, so I needed a new approach. I reread the biography a few times, which stated the key was found "in the belly of the fish", not the stomach. 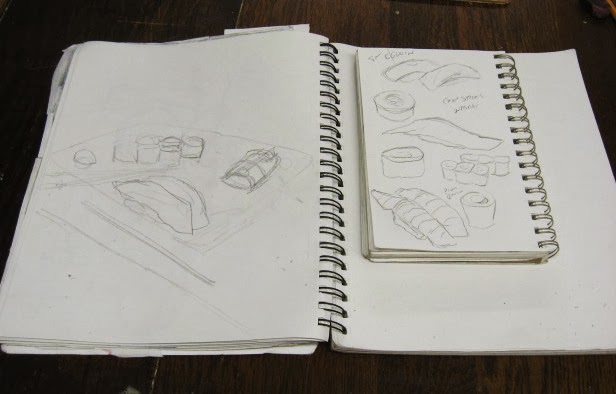 Seeing the word belly brought to mind the belly meat of tuna, prized by eaters of sushi. There was my new thing. I don't dislike sushi, but I'm not so into it that I get it a lot, so I mostly did internet research. Lots of sketches on paper (above) from photos I found there. From those I developed a composition, and by January 22nd, I had completed the block sketch shown below. 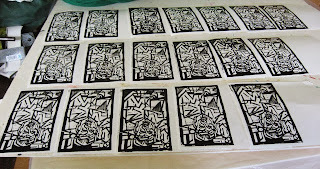 By January 26th, I had finished cutting the block and pulled three proofs. Colors on the first were purely experimental, the second had a more finalized combination, and on January 30th I colored the final version, shown below. I packaged it in a sheet of glassine, inside a mat board folder, in a piece of wrapping paper, her name printed on it from metal type, and placed in the baby gift bag in time for the February critique. And there is sat until tonight. However it did mean that I had something new to show tonight, my first new print since the summer. Jane said she really liked it, which made her feel bad to tell me that the baby's birthday had been December 31st. I wrote down exactly what Molly told me, so wherever the mistake happened, it wasn't on my end. When it becomes December 31st here in New Jersey there's still a big chunk of the world in December 30th, so we'll go with that. And if Jane decides to commission future prints for any subsequent children, she'll know to contact me directly with the dates. We're now deep into the holiday season, and winter weather is all around us. It snowed all day yesterday. The accumulations around here were a few inches, but down toward Philadelphia they had almost a foot. As predicted, overnight things warmed up, the snow turned to rain, and by this morning it was all gone. Another wave of snow is predicted for tomorrow (forecasters predictions for the start range from 3:00 am to 3:00 pm), and even though the roads were fine today, sometimes the repeated threats can cause people to get nervous. So maybe that was a reason why we only had four people for tonight's monthly critique group, or maybe it was because we shifted it to the 2nd Monday, or maybe it was holiday fatigue. With the print shop messy with months of accumulated clutter (having the bigger table shop gave us an alternative space to work on everything), Molly wanted our meeting to be anywhere but there, and pushed for using the cafeteria space (no stage functions going on tonight) instead of the large but dusty table shop. The big surprise tonight was that one of our small crowd was Jane, a long time regular, but one who has been missing for more than a year. She took a leave from the group late last year in anticipation of giving birth to her first child, and though she has occasionally written that she planned to attend, this is her first appearance in 2013. (to be fair, she did manage to catch my Fourth of July installation in Belmar this past February) The critique group has often done some kind of holiday (homemade) gift exchange, and last year it was suggested that we put together some baby gifts instead. A gift bag of such things has been sitting on Molly's press since last January waiting to be distributed, with a special print from me in there, referenced a few times on this blog as a "secret project". Jane being here, I could finally make it public. I'll save the story of it for a separate post. Thus, the above board, art by four participants. 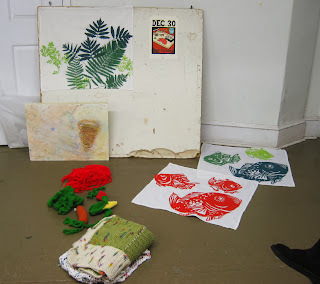 Starting from the upper left (clockwise) is one of Molly's screen printed towels, my secret woodcut, more screenprinted towels, some knitted items from Jane, and an encaustic painting from Sheilagh. 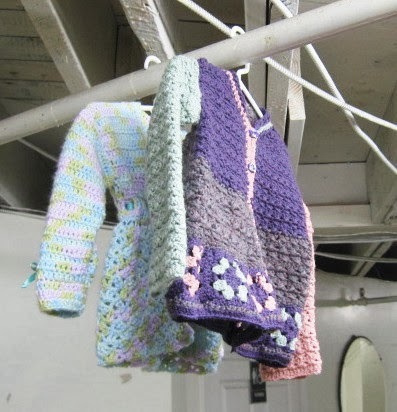 Below, two child sized sweaters from Jane. Tonight was the opening for the current shows at Art Alliance of Monmouth's gallery in Red Bank. During the day I took care of one last task, creating an artist statement and bio, along with a typed price list. The statement/bio was mounted on a standing piece of foam core for window display. Left for the reception a little later than I wanted to, but I made good time and once again was lucky to find a spot down the block from the gallery, maybe 3 or 4 cars away from where I parked on Wednesday. The day was chilly and the night was getting colder, so I was glad to get inside, arriving a few minutes before the official 6:00 pm start time. The main show in the gallery is their annual 100 Square Inches show, all small works. (I was in the versions that ran in 1996 and 1997) There were about 90 pieces total, from about 40 artists, all gallery members. Early on there were few people I knew, though I recognized a few who were around this past Wednesday when I came to hang my show. Eventually a few old critique friends showed up, people who I knew had a connection to the gallery, and in this case had works in the main show. Saw a few other people I know from Belmar. Don't know the total attendance, but at any given time there were at least 50 or 60 people there. As in Belmar, as the reception continued more and more people had migrated to the back room, which is where the refreshment table was, along with live music entertainment. People who knew who I was had a lot of technical questions, and some connected with running Art Alliance expressed interest in the idea of possibly trying a print class there. Scheduling may be tricky (they already run a lot of classes), but I'm open to the idea if we can work it out. 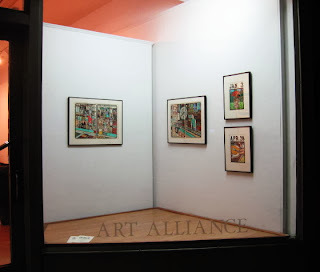 My window display, and the small works show within, remain in the gallery through January 2, 2014. Admission is free. 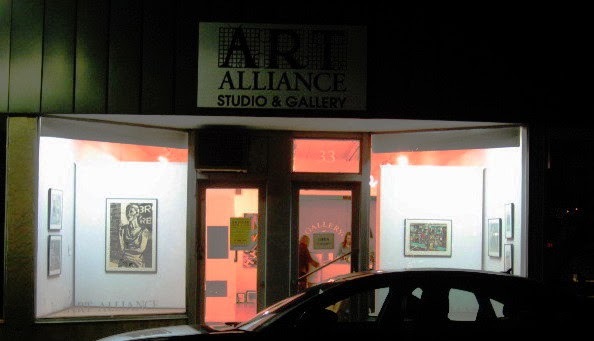 Back in mid-May I got an e-mail from Elaine Shor, a co-curator and vice president of Art Alliance, a co-op gallery in Red Bank. I was a member of the gallery for a few years back in the late 90's, participating in a dozen or so shows. They mostly did juried shows, the work judged from actual pieces that had been dropped off in person. In those days I had a fairly regular job in Shrewsbury, one town over, and so it wasn't too difficult to stop by to drop off and pick up work. But eventually I changed jobs and found other local places to exhibit regularly. 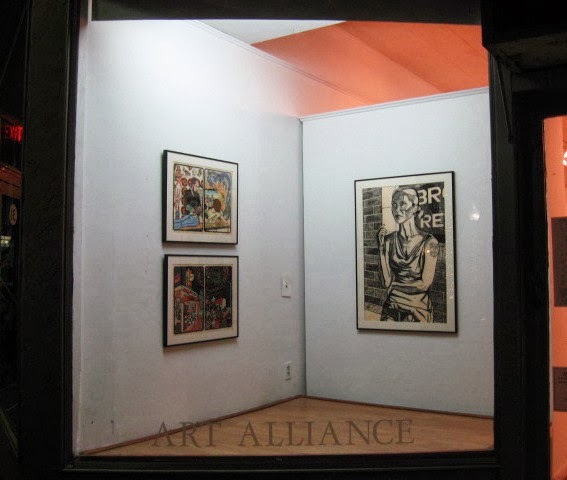 So I wasn't expecting to hear from the gallery, but the message was that the curating committee had decided to offer me their front window for the month of December. As far as I knew, I had never met Elaine, but I know some other regulars at the gallery, so I guess one of them must have been behind the invitation. I had no reason to decline the invitation, so I replied that I would do it. I didn't exactly put it out of mind after that, but I've had many other priorities since then, so hadn't given it much concentration. Right around the time when I was thinking I should probably get in touch soon and verify these plans, she sent another mail to confirm the show and installation dates. I had been meaning to take a ride up that way to measure the space, but as you all know, it has been a very busy autumn, so that never happened. A few online photos gave me at least a partial sense of the space, and I had been given the one direction that they preferred recent work. So I put together an assortment of prints from the last several years representing different aspects of my work. The two most recent saints (which may also be my two most recent prints), the smoking piece (set on a street, it will be viewed from a street), and four of the boardwalk prints. A few pieces required reframing this afternoon, but then I got everything packed up and loaded my car, including my trusty two wheeled hand truck, which has seen a lot of work these past few month in moving from one apartment to another. Parking in Red Bank's business/cultural district is traditionally a challenge, but I was lucky enough to find an empty street spot on the same block as the gallery. I could have carried the work by hand in two trips from the car, but with my wheels, it was easily done with one. They were just finishing up the intake of a small works show that will hang in the main gallery for the month. Elaine arrived and moved two portable walls into place. We divided up the 7 works into what seemed the best way to fill the walls, then hung them on screws driven into the walls. Above and below are the left and right side windows. I still need to put together a statement and type up a price list, but I can bring those to the opening reception on Saturday, December 7th from 6 to 8 pm. 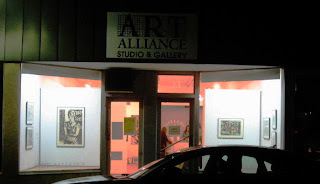 Art Alliance is at 33 Monmouth Street in Red Bank. 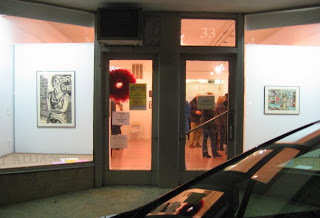 The gallery hours are Tuesday to Saturday, noon to 4 pm, but since my work is in the window, you can see it 24 hours a day until the show ends in early January. With my apartment cleaning project done, I could go back to the Studio for one last bit of table work. Herb had been concerned about getting all the tables out of the lobby before tonight's big holiday tree lighting and concert, so I went directly to the first floor and found they were indeed gone. 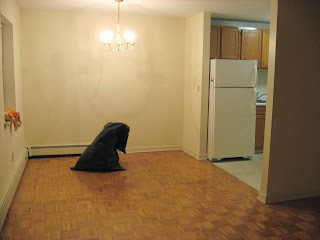 I then went downstairs to the table shop and found the drop leaf table sitting in the hallway outside our locked door. Well, that is the one I came for anyway. I had done some experiments last week and knew there were a few more things that needed fixing. I brought it into the table shop and put it legs up on a work table. I had seen last time that one of the sliders was broken- a screw no longer holding. I took that inside stop and trimmed its width by about an inch or so, so that its span matched that of the two sliding pieces. Besides providing fresh places to drill the holes for the screws, fixing the width of the end would let me add sliding guides as I did for two of them last week. Did it for the last remaining one as well. Did a little sanding as well before I put it back in place. In the above photo, the one on the left without the stain on the top is the newly repaired stop. Put it back on its legs and brought it back out to the hallway. I had wondered if the table was out there in case someone was maybe coming by to pick it up. I couldn't reach Molly by phone, so I just left her a message saying what I had done and that it was ready to go if someone was coming for it. And with that my part of the project should be officially over. There are still three tabletops for Molly to carve, but only she can do that. Since I've taken it this far, if I run across the finished tabletops in the Studio, I'll get photos and post them here, but my next time working with wood will be a print. Haven't made a whole lot of prints this year, so I'm looking forward to resuming my boardwalk series soon, though I'll probably work on my annual Christmas card first. 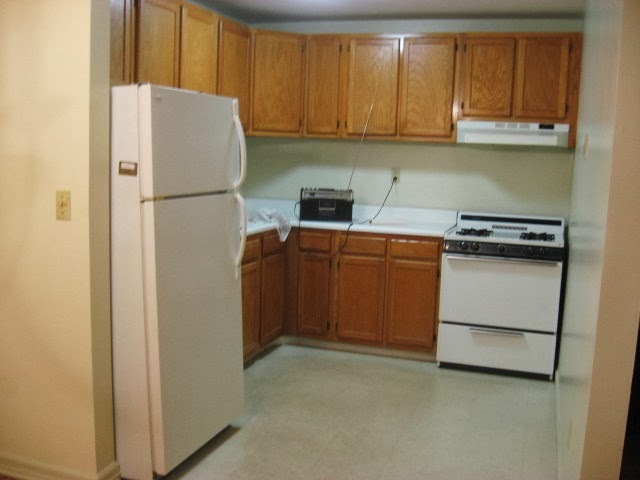 Regular readers know that working on the Table Talk project has taken up a lot of my available time since the summer, but so has another project- moving from one apartment to another. The process has been going on for a while, but this weekend I put in two very long days, and now it's pretty much done. I still have to gather up some of my cleaning supplies and equipment, but that can wait until the morning. 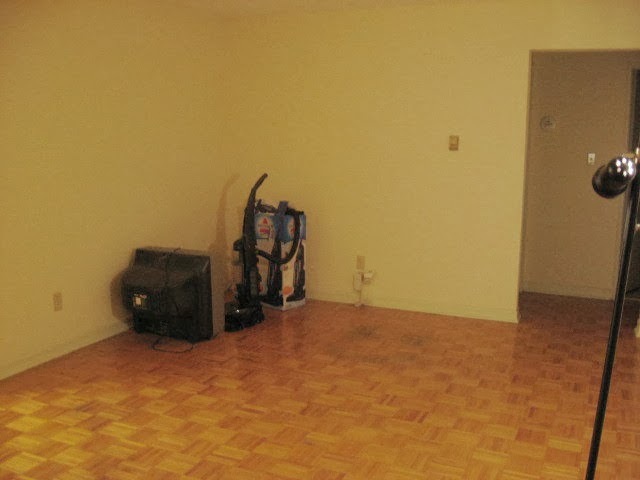 Besides the impact that this process has had on my artistic output, the real reason that I'm posting these photos is that it's the only way my mother will believe that I actually got the place emptied and cleaned.